Our classes are designed for adults to be able to work at their own pace. Through training in Tae Kwon Do, you will gain greater self-confidence, improved balance suppleness, and flexiblity, weight loss, reduction of stress, and many other numerous health benefits. We understand the need for adults, especially when starting a physical activity, to work at your own pace. You will never be pushed to do more than your body allows, allowing you to be able to work your way up to physical fitness. We have students come that haven’t exercised in 10 years and some that exercise every day. The classes are geared so you can work at your own pace while building up your endurance. We require sparring at Sr. Yellow belt level. Some questions that come up when talking about sparring are what is sparring, and is it the same as fighting? Please read the explanations below. Sparring is physical match limited by certain restrictions that are designed to protect participants from injury. These restrictions include: protective gear, off limit areas of the body, point scoring, referee or instructor. Other factors that make sparring different are: opponent reaction to technique is not the same, mental state in sparring is not the same. Sparring helps to hone the skills you have been working on. It improves focus, concentration, self discipline and control. It also trains the student to understand the amount of power to place behind their kicks and punches in case of ever encountering a situation where they need to defend themselves. It is the only way to truly get their feet wet and understand all they have been taught. HOW DO WE TEACH SPARRING? Sparring is always done with supervision. The students must exhibit self control in order to participate. We use targets, one on one, and free sparring. An instructor is always in the ring during free sparring and we only run rings based on instructors. We offer a Women’s Self Defense program aimed at equipping women with the tools they need to protect themselves in today’s environment. Our self defense program is unique in that it doesn’t teach the material in a few hours or as a workshop but is an ongoing program. This way the response becomes reactionary and not “learned and forgotten”. The only way to truly learn self defense and retain it is by little bits over a period of time. Many women take one day workshops and still get into trouble because when they are in a dangerous situation the information they had learned to defend themselves with is forgotten. We want to know that women can confidently defend themselves during high stress moments. Classes are held on Saturday. 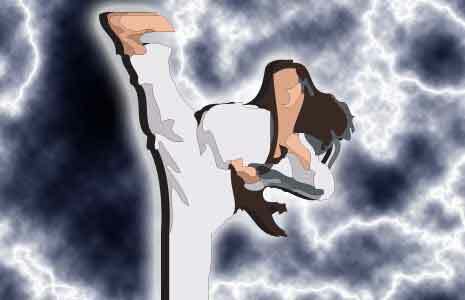 Class are cancelled one Saturday a month due to belt testing in our Tae Kwon Do program.